Hard Days, Hard Nights is the fascinating, behind-the-scenes story of the birth and development of modern rock concerts, as told by one of its most illustrious proponents, Pat DiCesare. For 36 years, starting with his first show in Youngstown, Ohio with the Four Freshman, to his big breakthrough promoting the Beatles concert in Pittsburgh, PA in 1964, through his last major show in 1999, Pat DiCesare ruled the Pittsburgh concert scene. Virtually every major rock and pop act of the area—from the Rolling Stones to Led Zeppelin to Bruce Springsteen—passed through Pittsburgh during these years to perform in concerts produced and promoted by Pat DiCesare. These are the backstage tales of those shows and how they came to be—the untold story of one of America’s most beloved industries. The first baseball stadium we ever played was a show promoted by Pat DiCesare. He was one of the only promoters we trusted to do big shows and we were right…through all the craziness…floods…insanity…he gave us and the fans a great night. Thanks, Pat! Pat worked with a great era of music, producing all the big shows. Reading his book brings back great memories of happy times from music all over the board. Pat DiCesare was always there in the beginning. He had a creative force that helped so many artists. Thanks for the support and guidance. It was appreciated. Congratulations and Best Wishes for your continued success. Pat has ‘seen it all’ – I remember him so well from the beginning of my career to his amazing success as one of the ‘legends of promotion’ and, a great friend! After Pat’s Beatles’ Show, we at KQV hooked up with him and his late partner to present the “KQV Shower of Stars” at Pittsburgh Civic Arena—so many great shows with the contemporary acts of the day! Over the years I was the MC and got to meet all of the luminaries of the music biz. One highlight was riding in a limo with Sonny & Cher to Greater Pitt after their concert. F-Bombs were flying in both of their tirades toward each other. Pat is a true show biz legend before my eyes and ears! Pat DiCesare had a front row seat during the birth of the modern concert business. For decades there rarely was a show that passed near Pittsburgh that he didn’t have a hand in. Concert promoters are often participants in amazing events with inside stories and tales of amazement that could never be told publicly if they want to stay in the business. Pat’s now retired and lucky for all of us, he is now free to speak about his Hard Days in the industry. 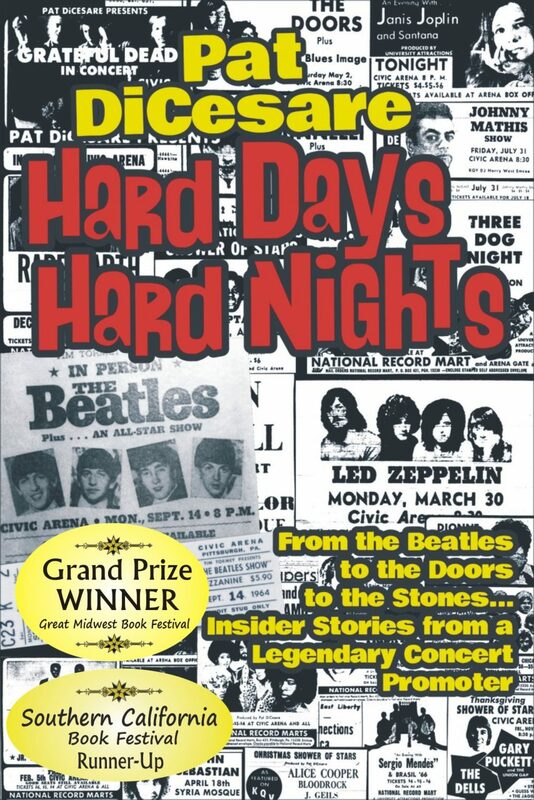 Hard Days Hard Nights by Patrick J. DiCesare is the story of the birth of the rock ’n roll concert business in Pittsburgh. The book begins with Pat’s rather humble beginnings, migrating from Italy in 1920, and dwells on his childhood, earning nickels by delivering newspapers and learning music on a second hand bass. Soon he starts playing, joining a newly opened nightclub, and is eventually offered a position as the head busboy. The author describes arranging a Beatles’ show, the sensation of the times, with great difficulty, only to find himself drafted, and every month collecting a part of his share of the show’s profit (a hundred dollars) and feeling like the highest paid soldier in the US Army, as well as hobnobbing with bigger names like Jim Morrison, Led Zeppelin or Aerosmith, and conducting his own concerts and shows.